Scholarships change lives for MCN students. Illinois State University Mennonite College of Nursing (MCN) offers several private scholarships for students accepted into the nursing program. For the 2015-16 academic year, nearly 300 nursing students applied for private scholarships, and 87 were awarded. For the 2016-17 academic year, there will be two new scholarships available: Ralph and Louise Bellas Endowment Scholarship for International Transcultural Nursing Scholarship and the Heritage Geriatric Nursing Scholarship. Ralph Bellas joined ISU’s English Department in 1965. During the 1970s, he served as director for three student groups to Brighton, England, in the international exchange program. Although retiring in 1979, he served on two more occasions in the 1980s as student director of ISU’s program with Nansan University in Nagoya, Japan. Among his publications is Mennonite College of Nursing 1985-1995: The Flame Burns Brightly. Prior to coming to Mennonite School of Nursing, Louise Bellas practiced nursing in several U.S. cities. Public health nursing was her area of interest and expertise. She taught at Mennonite from 1972 to 1985. She was in England in 1974 to arrange an international student exchange program between Mennonite and the Royal Sussex County Hospital in Brighton. Her publications focus on her nursing experiences. The parents of three sons and three daughters, the Bellas volunteered in the U.S Peace Corps in the Fiji Islands of the South Pacific, while Louise taught at the Fiji School of Nursing. They have traveled extensively in the U.S. and many foreign countries. 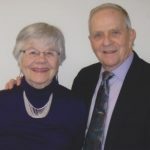 Their commitment and contributions to Mennonite College of Nursing were acknowledged in 2009 when they received the Mennonite Nurses Organization Service Award. Ralph and Louise Bellas established this scholarship in 2015 in order to assist students wanting to participate in international nursing exchanges, where they could experience medical technology, treatment, and patient care within different culture settings. Heritage Enterprises was founded in 1963 as an early innovator and leader in senior healthcare. Since 1999, when Mennonite College of Nursing arrived at Illinois State University, Heritage has partnered with the College to provide innovative education models and support through shared collaboration, that have endured through many changes in healthcare. Many student’s very first clinical experiences were held in Heritage Enterprises facilities, graduates have become important members of Heritage Enterprises team, providing continuing nursing education through advanced nursing simulation education. Today, Heritage Enterprises provides healthcare and therapy services to thousands of senior citizens and provides employment to thousands of dedicated healthcare professionals. Heritage continues to grow, proud of its record and recognition for quality in the healthcare field. Heritage knows the value of an outstanding nurse, and is proud to support students with an interest in caring for older adults. Their hope is through their experiences at Mennonite College of Nursing and Heritage Enterprises that all students recognize the field of long term is dynamic, innovative, and leads to fulfilling careers. For more information about changing lives through a scholarship, please contact Jenny Ward at (309) 438-7418.